The road that led to the first successful adaptation of the works of J.R.R. 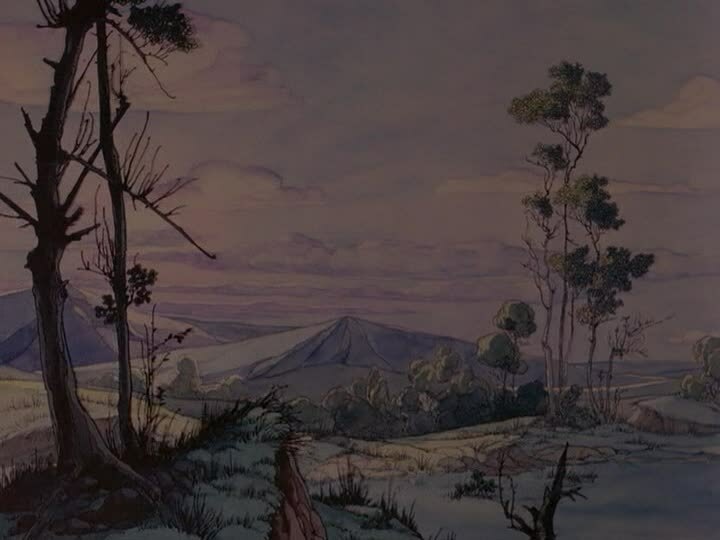 Tolkien was a long and tormented one: attempts started as early as the 1950s, only to fail in the face of Tolkien's disapproval of scripts and filmmakers terrified at the thought of condensing the massive totality of The Lord of the Rings into even a very long single feature; it takes us past a 1966 animated short, The Hobbit, made solely to preserve a producer's option on the author's shorter, earlier fantasy novel, past a stalled dream project for the Beatles to star in a feature-length LOTR directed by Stanley Kubrick; and finally, four years after the author's death, after decades of wrangling, a full-length adaptation of The Hobbit premiered on American television in 1977, just a couple of months after the book's 40th anniversary. The film was produced by Rankin/Bass (and directed by namesakes Jules Bass and Arthur Rankin, Jr.), a studio well-known then and now for its run of stop-motion TV holiday specials (chief among them the iconic Rudolph the Red-Nosed Reindeer), but who had already by this time released a good number of standalone projects - some of them even managed to make it into theaters! - which spoke to a slightly higher level of ambition. Still, nothing they ever made before The Hobbit, and only a very small sliver of what they made following it, matched its achievement and scope. And let us not be unclear about what those words mean in this context: Rankin/Bass was not in the business of making terribly complex or costly films (though at $3 million for a TV special, The Hobbit was hardly a cheapie), and the 1970s were not a decade where the sort of lush, supremely fluid animation that we're accustomed to nowadays was at a high ebb; it was a time of significant stylistic experimentation, without a doubt (possibly the overall boldest decade in the history of American animation, I'd argue), but a time of scratchy, jerky style as well. -and fascinatingly un-cuddly character designs, all grotesque physical exaggerations (giant, beak-shaped noses abound here, as do morbidly large eyes), and superfluity of lines jaggedly, aggressively carving all of the characters into maps of wrinkles and creases. 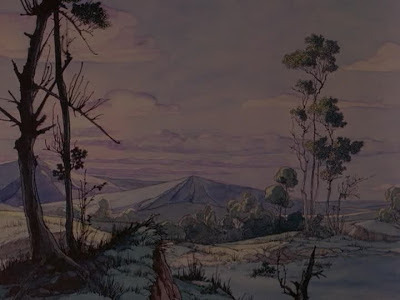 It is, reportedly, an attempt to translate the style of British illustrator Arthur Rackham into animation; and it's not even that bad of an attempt, assuming we can credit the report. What it even more resembles is an attempt to replicate in low-budget circumstances the texture of wood carvings. Whatever the case, the visuals (the production design was by Rankin himself) winningly capture the archaism of the setting, whatever their deviation from our expectations about what animation is supposed to move like; I would hope at any rate that we're sophisticated enough in the 2010s to recognise that the alleged "limitations" of '70s anime (or, to be strictly accurate, animation which bears marked stylistic similarities to anime) are more a generic marker than proof of its inferiority. And I'm not above name-dropping: Topcraft, in due course, turned into the "seed" for Studio Ghibli, and leaning that fact in the course of writing this review was, for me, one of those "of course, it all makes sense now!" moments that make life worth living. The line of descent is obscured, but distinct. Of course, we were here to discuss filmed adaptations of Tolkien, not to pick fights with enemies of 30-year-old animation technique. 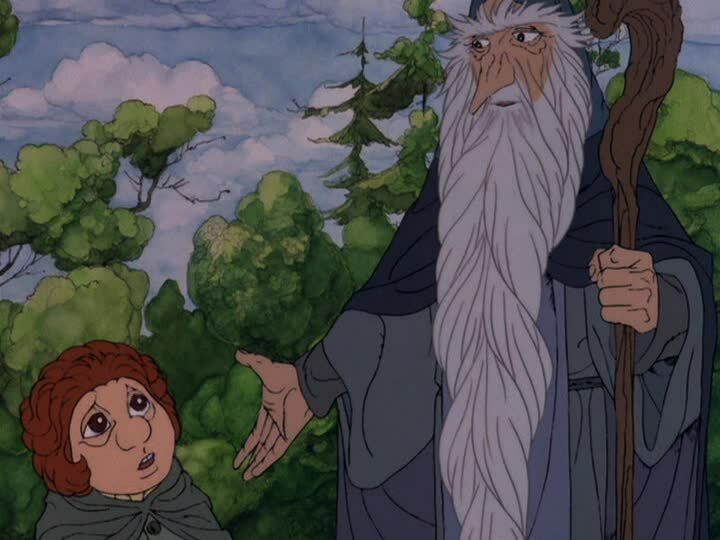 And now I am going to say something that may in fact be quite daft: I believe that the Rankin/Bass Hobbit is the most emotionally and tonally accurate adaptation of the author's work that has yet been released. Since this question will be of great, constant importance for the duration of this little retrospective, I will not go too far into qualifying that statement, but it is important to remember a few things that are easily forgotten in the wake of the novel The Lord of the Rings: as written in 1932, and published in 1937, The Hobbit is a children's book. A damned good children's book, of course, but not a dauntingly challenging or sophisticated one. I say all of this as a lifelong fan, please understand - I do not try to make The Hobbit less than it is. But nor do I try to make it more than it is, a terrifically invigorating story told in friendly, insistently un-serious language, spotted with the kind of creepy moments that are delicious to a child rather than traumatising, that very gradually darkens and increases its moral and thematic stakes towards the end. And that is precisely what I find in Romeo Muller's teleplay, which is breezy and unforced, dancing through plot at lightening speed in the manner of a fable or fairy tale, where concision and momentum are more important than depth and detail. Certainly, the animated Hobbit is far more concise than its literary source: having to cram even a not-very-long novel into the 77 minutes allowed by a 90-minute television slot will do that. And that leads to some distinct unpleasantness, like an opening ten minute that blaze through exposition so fast as to seem frankly uncaring, though I note that this bothered me far more as an adult than it ever did as a child (the film was on regular rotation during my time as a very small person, though I suppose it's been at least 20 years since I saw it last), which seems in keeping with the film's announced target audience. Also, let us not forget that even in Tolkien's Hobbit, large swaths of incident were rushed by in the span of a paragraph, or even a sentence; a journey that would take over 200 pages in The Lord of the Rings is glossed over in a single not-terribly dense page. So a certain insubstantiality was already baked into the material. The story - since I imagine there are newbies out there - follows Bilbo Baggins (Orson Bean), a nervous sort of hobbit (a small race of humanoids who existed many hundred or thousands of years ago; that is all the more that this iteration of the story gives us to work with), is shanghaied into an Adventure by wandering wizard Gandalf (an outstanding John Huston), to accompany a band of 13 dwarves, led by taciturn Thorin Oakenshield (Hans Conried), to their ancestral homeland at the Lonely Mountain, where a dragon named Smaug (Richard Boone) drove them out over a century before. Misadventures with trolls, spiders, a kingdom of angry goblins, and a tribe of wood elves and their king (Otto Preminger) befall the band before they arrive at the Lonely Mountain itself and tangle with the dragon; the most important of these is Bilbo's accidental subterranean game of riddles with the horrifying frog-like creature Gollum (Brother Theodore), during which time the hobbit acquires a ring that can make him invisible, and this proves an invaluable boon to him throughout the journey. The intense speed with which this is all told prevents us from getting much time to know the characters, though at least the film is lively and fun to watch; and granting that it's simplified and lacks psychological shading, it's pretty true to the book, all in all. One deleted subplot actively weakens the film's third act, by making the falling-out between Bilbo and Thorin seem far more shallow and arbitrary than Tolkien had it, but that's really its worst failing as an adaptation, and it arguably improves upon the book's most impressive trick, of shifting naturally but decisively from frivolous comic adventure to sober message about life and death; the film takes a considerably more assertive anti-war sentiment than the book did, and given the later developments of Tolkien's philosophy, I suspect this is a change he'd have admired (not least of the ways the movie grows to a harsher climax: Tolkien killed three of his dwarves, one of them "onscreen"; Rankin & Bass kill seven, two of them onscreen). In light of the later books, the representation of Gollum as some kind of monster is nonsensical, but it speaks to one of the things I like best about this Hobbit: it totally ignores The Lord of the Rings, refusing to "serious-up" the material just because of its later, unintended developments (the one exception: a final scene that baldly and ineffectively sets up the story's sequel, in a desperately leering way that completely scuttles the sweet, homey feel of the book's final lines). The ring was just a ring, Gollum was just a fish-eating cave beast, the goblins were just fairy-tale creatures. And I love all of these things, particularly the design elements: while not at all the images the book leaves me with (particularly the felid physiognomy of Smaug), they make for an imaginative animated fantasy. So, having said all of that, let us shift over to the film's weaknesses: and not just conditional problems, like the fact that a 77-minute film is going to have to burn through sequences as fast as it possibly can, and leaving the odd plot hole here and there (while fixing others - by reducing the amount of detail provided, the film manages to solve three of the book's most glaring contrivances: that the dwarves just happened to reach Rivendell on the exact night that their map could be decoded by the moon; that they just happened to reach the Lonely Mountain on the only day it could possibly be unlocked; that there just happened to be a human descended from ancient bird-talkers in exactly the right place to kill the dragon with the help of a thrush). The Hobbit is plagued - and that is undeniably the right word - by a collection of twee folk songs, almost all of them adapted from Tolkien's own lyrics scattered throughout the book. And this is, in part, a good thing: the presence of songs was an important part of the book's effect, and it was well of the filmmakers to try and replicate that. But while Bass's reworked versions of the Tolkien poetry is effective, Maury Laws insipid tunes are emphatically not, noodling around with the blandest kind of easy-listening acoustic frippery, and only their extreme brevity - not a single one reaches the end of Tolkien's lines - makes them palatable. As for the film's one original number, the frequently-reprised "The Greatest Adventure", it is unspeakably banal, sung by Glenn Yarbrough in what feels more like a parody of '70s folk than anything else. Of course, it can also be argued that the film's simplicity and studied targeting of a young audience at the expense of any real depth or resonance - outside of its significant visual appeal, there's really not much here for a grown-up looking for a rich time at the movies - is itself a major weakness; on this subject I count myself agnostic. The Hobbit doesn't seem very complex in the cold light of day, that is unabashedly true. But does this mean it lacks depth or resonance? It certainly feels like the answer is "yes", but I can too vividly recall an eight-year-old version of myself who found it awfully resonant indeed. And since he, and not I, is the person for whom this movie was made, I will elect not to second-guess him. Besides, there is something undeniably fun about this kind of crisp, unfussy fantasy storytelling, and the value of fun is ageless.